UK Release Date - 16th September 1996. US Release Date - 20th August 1996. Tracks 02/03 - Performed by Joe Elliott/Rick Savage/Phil Collen. Tracks 02/03 - Produced by Pete Woodroffe/Joe Elliott/Rick Savage. Tracks 02/03 - Engineered/Mixed by Pete Woodroffe/Ger McDonnell/Joe Elliott/Rick Savage. Studio - Joe's Garage, Dublin April 1995 (Tracks 02/03). Track 04 - Performed by Phil Collen. Track 05 - Performed by Vivian Campbell. Special Formats - UK CD2 Limited Edition with Four Collector's Album Cover Postcards (5-8). The third single from 'Slang' was released in September 1996. 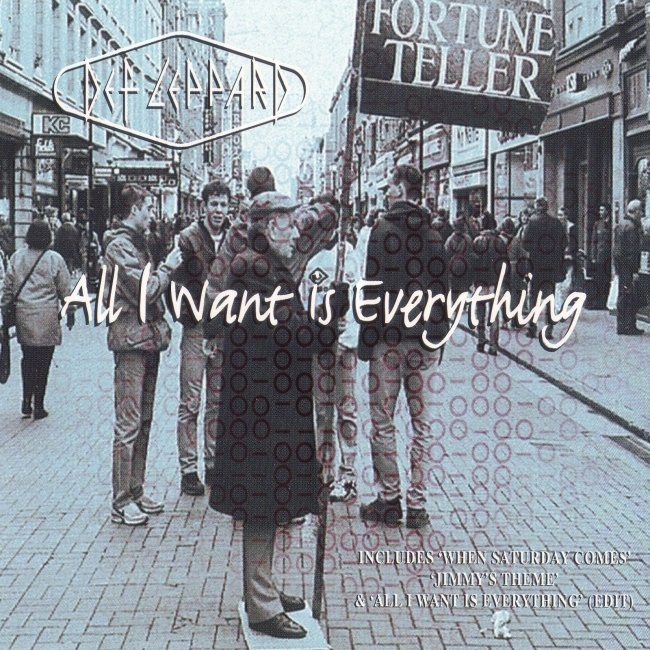 'All I Want Is Everything' was the first ballad to be released from the album and it made the UK Top 40 charts at number 38. The single was released over two CDs in the UK. Both featured four songs by various band members from soundtrack and/or compilation CDs they were involved with since 'Retro-Active' was released. CD2 like the previous single came in an album jewel case. It included the second set of Def Leppard Album postcards - Adrenalize/Retro-Active/Vault/Slang. All featured messages from the band about the albums. "In your hands is Part I of the latest single from the "Slang" collection, along with a few songs previously unreleased on any single. "When Saturday Comes" & "Jimmy's Theme" come from the motion picture "When Saturday Comes", a film based on two topics near and dear to us: Sheffield and football. When the producers of the picture came to Joe with the notion of penning a few tunes for the movie score, he immediately came up with both songs, and Phil & Sav joined him at his home studio to lay 'em down on tape. They appear on the soundtrack to the movie, but this is the first time they've been available on any singles. The last song is an edit of the original version of "All I Want Is Everything". We thought you might want to have a copy for yourselves, since it's probably the one you've been hearing on the radio." "In your hands is Part II of the "All I Want Is Everything" single collection, complete with a few songs previously unreleased on any single. "Cause We Ended As Lovers" and "Led Boots" were originally recorded by Phil and Viv, respectively, for the album, "Jeffology: A Guitar Chronicle", a guitarists' tribute to Jeff Beck. The guys were pretty happy with how they turned out, and thought they'd make for some unique bonus songs for a single. The rest of us agreed, and now they're in your hands for you own enjoyment. (Rest same as CD1)".